“…when H4H stopped the program in Quang Tri in 2010 due to lack of funding, I shared my humble graduate salary to help some of the students…” – said Diem Bui, H4H Edu scholarship recipient from 2000- 2010. Diem came from a poor family of 6 children from Quang Tri, Vietnam. She was one of the first few H4H Edu program recipients when we first established in 2000. She soon volunteered as Program Field Officer in her province from 2001-2010. Diem graduated with a double degrees in Russian literature and Japanese language. A proud mother of a beautiful girl, Diem has a busy full time job as a tour guide for her many Japanese clients. 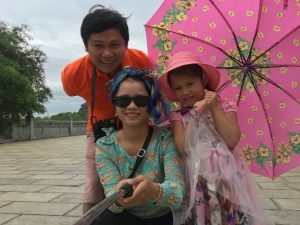 Both Diem and her husband, Ha Nguyen, an IT professional are volunteers for Hands For Hope in their role as Regional Manager Central Vietnam and Vietnamese translator respectively since July 2017. We are grateful that our Alumni are giving back to their community and carry on Hands For Hope legacy to continue helping the poor and the disadvantaged.